The 88 Project, April 5, 2017: Trần Huỳnh Duy Thức’s family visited him in Prison No. 6, Nghệ An province on April 1, 2017. They were allowed to see him for 60 minutes in a special room through a thick glass screen. They couldn’t hear each other directly and had to communicate through a speaker phone. Their conversations were recorded and monitored under the strict supervision of about 10 superintendents. Many letters, books, and magazines that the family had sent Thức were also returned, sometimes without any clear reason. Magazines such as the English versions of The Saigon Times were returned for being “materials in foreign languages.” Photocopies of Tai-chi exercises and other physical exercise instructions were refused for “being distributed by unauthorized publishers.” Letters from the family, copies of the American President Donald Trump’s speeches (in both English and Vietnamese), and even copies of legal documents with the National Assembly’s seal on them, such as Law on Religions and Beliefs, Law on Access to Information, and Law on Public Officials, that the family had printed from the website of the Government, were also returned without any explanation. Keep the electricity on during the day, and allow prisoners to receive battery-operated light to increase the light inside the prison cells. Guarantee the prisoners’ right to denounce and complain about prison officers who violate the law and human rights. Guarantee the right to access information: the right to access sources of information besides the limited information channels of Vietnamese Television (VTV) and Nhân Dân newspaper (both are state-owned media, and Nhân Dân newspaper is the official newspaper of the Communist Party of Vietnam). Guarantee the right to family visits: the family requests the right to visit Thức in a regular visit room so that they can talk directly with Thức, without the glass screen. Reduce the time used to screen incoming and outgoing letters: the current censorship time of the Prison is too long. 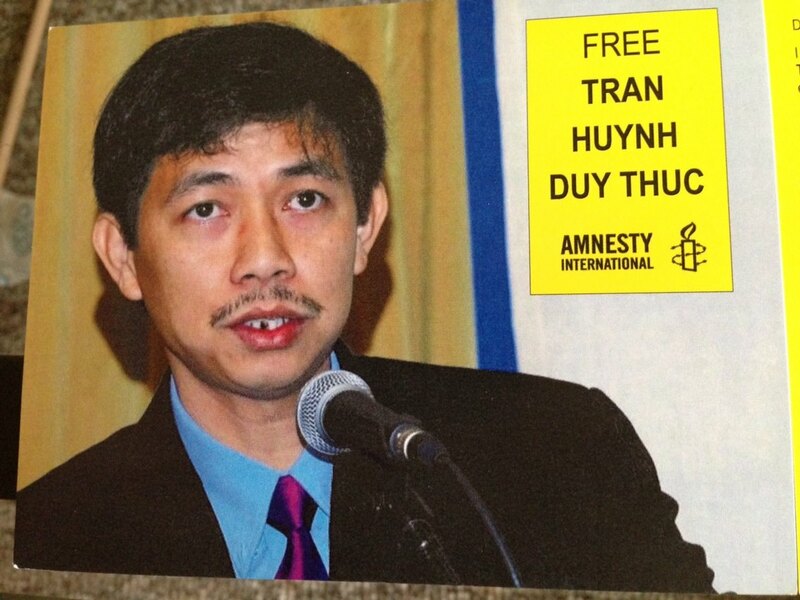 Trần Huỳnh Duy Thức is currently serving his 16-yearsentence in Nghệ An prison in Central Vietnam, about 1500 km away from his family in Hồ Chí Minh city. He was arrested in May 2009 and sentenced to 16 years of imprisonment and 5 years of probation under Art. 79 of the Vietnamese Criminal Code for “attempting to overthrow the people’s government” in January 2010. In August of 2012, the U.N. Working Group on Arbitrary Detention reported that Thức and his co-defendants’ arrests and detentions were arbitrary and called for their release from prison. See Thức’s full profile here.